COLUMBIANA — Clarence Emerson Mansfield, 87, passed away Dec. 2, 2018. He was born on Dec. 14, 1930, to Elsworth and Cora (Shinkle) Mansfield. He was preceded in death by his parents; sister, Pauline (Mansfield) Hurst; son, Norman; grandsons, J.D. Mansfield and Robert “Kyle” Mansfield. He was ordained into ministry on Aug. 29, 1951, and graduated from Kentucky Christian University in 1952. 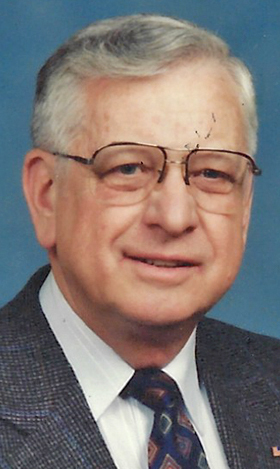 He ministered for nine years in Kentucky and for five years in Illinois before beginning his ministry at First Christian Church in Columbiana, Ohio, where he served as senior pastor for 32 years. He was chairman of the board of trustees and later vice president of HASTEN, International, a medical mission with partners in Cuba, Mexico, Dominican Republic, India and Zimbabwe. He was also a Kentucky colonel. He is survived by his wife of 68 years, Priscilla (Pat) Mansfield; son, Larry (Denise) Mansfield of Newark Ohio; daughter, Kathy Durham of Austintown Ohio; daughter-in-law, Jean Mansfield of Delaware, Ohio; son, Steve (Lisa) Mansfield of Whitehall, Ohio; son, Vince (Diane) Mansfield of Simpsonville Ky.; 14 grandchildren; and 17 great-grandchildren. Funeral services will be held at 11 a.m. Saturday, Dec. 8, at First Christian Church in Columbiana, Ohio, with burial to follow at Firestone Cemetery. Friends may pay their respects from 4 to 8 p.m. Friday, Dec. 7, at Seederly-Mong and Beck Funeral Home and from 10 a.m. until the time of the service Saturday, Dec. 8, at the church. Expressions of sympathy may be made to HASTEN, International, 2360 S.E. Seventh PL, Homestead, Fla. 33033.